B and I traveled a TON this month so I'm sorry that I don't have a fun costume to include in these outfits. What I do have is actually quite contrarian for a day like today - white fall looks. Both outfits were inspired by Caitlin, one of my favorite fashion bloggers who writes Southern Curls and Pearls. First up, one of my favorite ways to dress up a plain tee shirts. Here I paired a white tee with it's classic black jean counterpart. 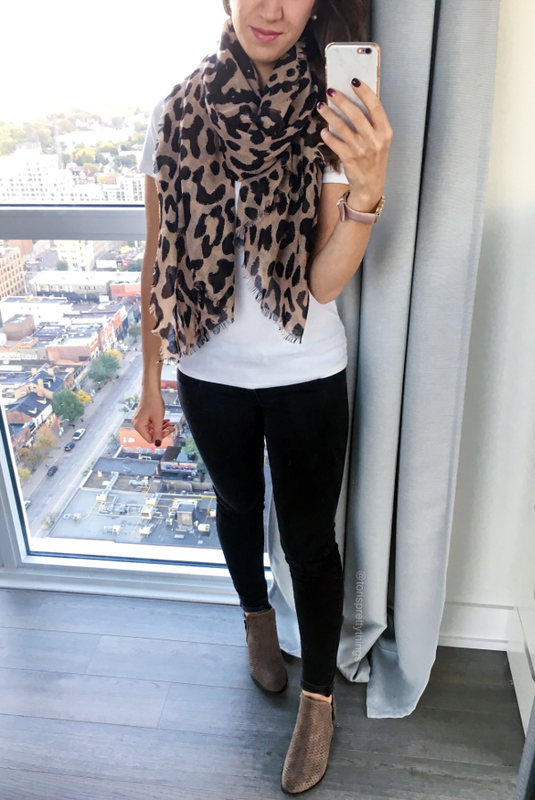 I added taupe booties and this leopard scarf that I was itching to wear ever since I scooped it up during the Nordstrom anniversary sale. For the second look, please apologize the not-so-great quality. I'm hoping the look is cute enough to overlook it, though! Caitlin shared that this original inspiration is one of her most popular pins on Pinterest. Putting the look together in real life? I can see why! I feel so chic in this combo - who knew that white jeans and a burgundy sweater worked so well together? :). I hope you have a wonderful and safe Halloween tonight! As for me, even though I'll spend a good chunk of the night packing, there's still an ice cold Reese's and Charlie Brown and the Great Pumpkin with my name on it.